The uk plans to claim sovereign rights over a million square kilometres of the remote seabed off Antarctica. The move is believed to be a prelude for seeking exploration rights over potential hydrocarbon and mineral deposits around the South Pole. 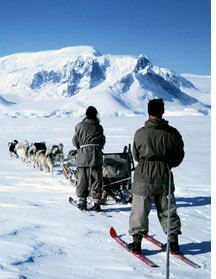 The claim would be in defiance of the spirit of the Antarctic treaty, to which the uk is a signatory. The treaty specifically states that no new claims shall be asserted on the continent after the treaty was signed in 1959. But the uk says its claims have sanction under the un Convention on the Law of the Sea. It plans to extend its oil, gas and mineral exploitation rights up to 350 nautical miles offshore into the Southern Ocean beyond the British Antarctic Territory. Much of the seabed there is at such a depth that extraction of gas, oil or minerals is not technically feasible yet. The claim may anger Argentina and Chile, who have overlapping stakes over Antarctica. A similar development was seen in the North Pole in August, when against the backdrop of a record ice melt, Russia planted a flag on the Arctic seabed in a symbolic claim to the territory.